Children liked the product which was easy to use and understand with clearly written teaching notes. We found the Multiplication grid to be invaluable and easy to integrate into our maths lessons. The children found the grids very tactile and they appealed to all learning styles. 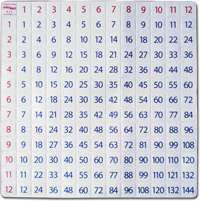 Dyspraxics found it easier to track numbers by folding the grids rather than following a line. Aside from improving their maths skills the pupils had a greater independence when using the Flexitables and their self confidence increased. Flexitables have a pleasant feel with clear instructions that are also easy to understand. They proved to be a worthwhile resource. We got positive feedback from our pupils who told us that the Fraction grid made them accessible for all of them. Flexitables are a “peace of mind” resource that gets across certain aspects of the maths curriculum by being easy to use. My pupils found the Flexitables to be a good size, tactile and easy to use and understand. The teaching notes were clear and well written. Young children found it easier to learn their number functions by using the Flexitables. All of our children preferred using them rather than cardboard equivalents because they can be folded repeatedly and quickly giving them their answers more easily. The grids gave them an insight into the different number patterns, confidence in learning and using various processes as well as being a good resource to practise with. Special Needs Children found the grids helped them solve problems more easily without their lack of knowledge of multiplication tables holding them back. The Fraction grids also helped make it easier to understand the role of fractions.